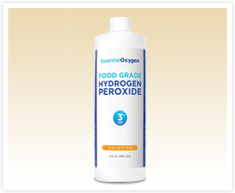 Food-grade hydrogen peroxide is a natural and inexpensive way of helping the body receive the oxygen it needs to get and stay healthy. It has been used for more than a century all over the world as a defense against micro-organisms that invade our immune systems. Food-grade hydrogen peroxide re-oxygenates the body, creating a positive environment allowing good bacteria to thrive and bad bacteria to die off, strengthening our immune system, and our entire body as a whole. Give your body the support tools it needs to fight diseases on its own, allowing you to take control of your health.